This Wall Mounted Shower Seat is height adjustable so that the user can set at a height that is suitable.The arms lift independently enabling safe transfer and there is a back for added comfort. 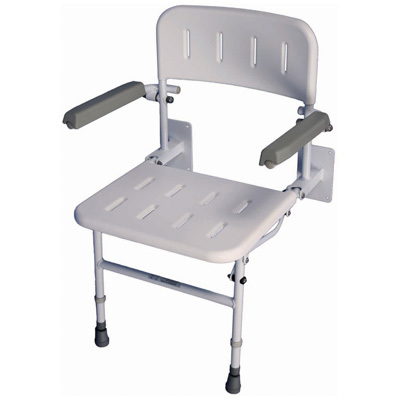 This Wall Mounted Shower Seat is height adjustable so that the user can set at a height that is suitable.The arms lift independently enabling safe transfer and there is a back for added comfort. The frame is constructed from rust free aluminium and the injection moulded seat and back clip on and off for easy cleaning and maintenance.The seat is simple to install and folds up when not in use.